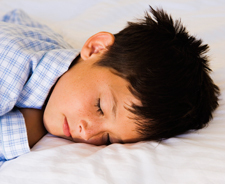 Bedwetting takes a tremendous toll on children. Embarrassment. Alarms. No sleepovers. Plastic mattress covers. Frustration. Unable to fit in. Even the shame of diapers. Up to the age of four or five, most children have poor bladder control at night. But after that, the inability to stay dry is a sign of an underlying problem. While chiropractic is not a treatment for bedwetting (nocturnal enuresis), countless children have been helped with safe and natural chiropractic care. During the early years of life, the sacrum has five separate segments. Later, they fuse together to form the triangular-shaped bone that adults have at the base of the spine. If these segments misalign (falling, learning to walk, ride a bike, etc.) they can compromise the nerves that are responsible for bladder control. Chiropractors look for these sometimes-subtle misalignments during a thorough examination. When these misalignments are reduced with safe and natural chiropractic adjustments, nervous system control and regulation of the bladder is often restored. Chiropractic has produced tremendous results among bedwetters with neurological compromise. Since chiropractic isnt a treatment for bedwetting, a thorough examination is necessary. If the bedwetting is caused by nerve interference from the spine, many children see great results with chiropractic care. Find out! Chiropractors approach these cases with sensitivity and compassion. Your son or daughter will appreciate and understand the explanations of a chiropractor. Find an Association member chiropractor near you and begin safe and natural chiropractic care today.